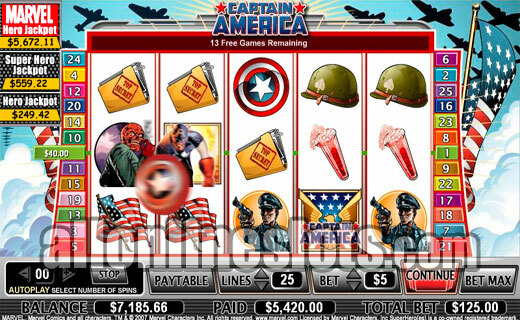 Captain America is a 25 line slot from Cryptologic. The game is part of the Marvel Jackpots range which means you have four random progressives. On the base game you have a 12,500 coin top jackpot as well as a pick a box bonus stage. Having made his first appearance in comic books in 1941, Captain America has moved to the realm of the slot machine. Born in New York, Steve Rogers AKA Captain America protected liberty and freedom from a range of villains. The most famous of who is Red Skull who also appears on the reels. The game is part of the Wagerlogic Marvel Jackpots series and as with all of the slots in this series the graphics really have to be seen to be believed. The symbol animations on the reels are impressive but the second screen bonus stage really takes things to a new level. Captain America uses the 5 reel, 25 line format and comes in the following coin sizes - 1¢, 2¢, 5¢, 10¢, 25¢, 50¢, $1, $2 and $5. Maximum bet is 25 coins so you can be spinning for as little as 25¢ or as much a $125. The higher you bet the higher the potential jackpots. You will also find that the Marvel Jackpots link works in such a way that the bigger you bet the better your chance of winning one of the three jackpots. The progressive jackpots are randomly awarded and require no specific combination on the reels. On the reels the Captain America logo is wild. Lining up five wild symbols on any active line awards the top line jackpot of 12,500 coins. The wild symbol has a great animation where Captain America's famous shield shoots out of the screen in an almost 3D fashion. Second highest line pay on the reels is for five Red Skull symbols which pays 5,000 coins. The Steve Rogers symbol comes in next with a 1000 coin pay followed by either five statue of Liberty symbols or five Nazi symbols which pay 500 coins. Overall there are a good range of mid size wins. 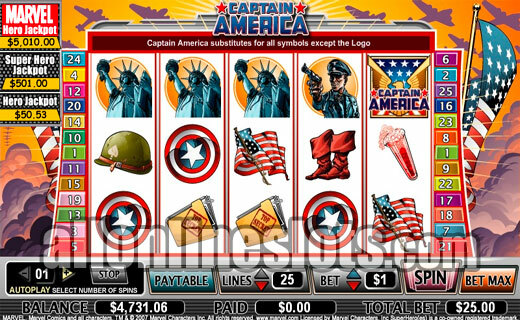 The Captain America logos are scattered and activate the bonus game. Getting five of the logos pays a big 100 times your total bet or 2500 coins. Three or more on the screen start the second screen bonus game. Here you get a great animation of Captain America on the battlefield. (View Screenshot). You get five shots at the planes. Simple aim the target at a plane and click your mouse button. Captain America then shoots the plane down. Each plane awards a random cash prize. 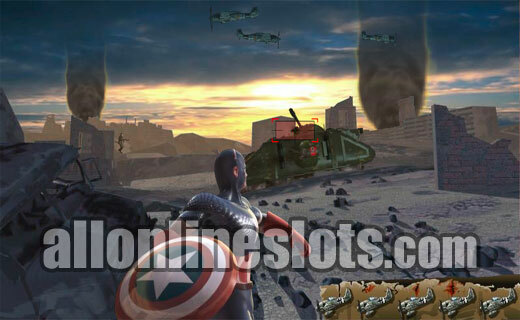 If you manage to shoot down the plane containing Red Skull you win 15 free spins on top of the bonus pays. During the free games all wins are doubled. This means if you manage to line up five wild Captain America symbols you can win a huge 25,000 coins. Unfortunately the free spins or bonus game cannot be re-triggered during the bonus feature. 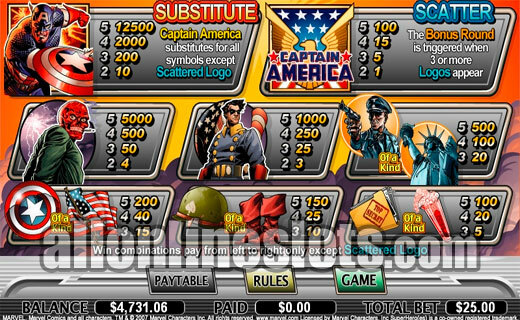 Captain America is a great new addition to the Marvel Comic slots range. The graphics are really impressive and the jackpots on the base game are good. Add in the random Marvel jackpot feature and this is a great game to play.